We've had heaps of bananas in our house recently so I have been looking for good recipes to use them all up. This banana bread recipe from Alischa's husband is super-yummy and easy to make too. 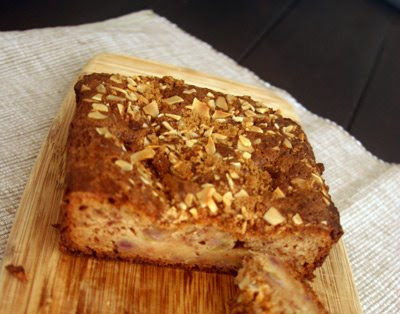 It's quite sweet with more than 1 cup of sugar to 1 banana, but very moist and I especially love the crunchy almond and brown sugar topping. You can find the recipe here. I swapped out 1/3 of the sour cream for thick yoghurt, and used self-raising flour instead of flour + baking powder (only because I had run out of plain flour). Cooking time was 1.5 hours for me. Yum! oh yum yum! maybe I should tell my husband of mine its time he made it again!!! And please thank him for me!! That looks so yummy...I'll have to try it soon. I like using yogurt rather than sour cream as well.